It’s hard to believe, I know: tasting notes for Casanova di Neri 2004 Brunello di Montalcino DOCG on Do Bianchi. But when I saw this bottle at a downtown Lecce supermarket for Euro 22.90 (see receipt below), I couldn’t resist the temptation to pick it up (that’s $29.51 based on today’s exchange rate). I opened and tasted the wine today before lunch and I have to say that it’s pretty good. Lighter in body than Giacomo Neri’s U.S.-bound Brunello, with bright fruit and some wood tannin on the finish. If it weren’t for the wood, I’d even say it was more than pretty good. I’m guessing that this wine is akin to his “white label,” as it is called in the states. On Winesearcher, I see Casanova di Neri for as low as $40. But never this low. Who knew it was a supermarket wine in Italy? I plan to taste it tonight with pucce for dinner (on our first night in Lecce, we had an early dinner of grilled vegetables at a rosticceria and last night we had take-out pizza in our B&B; tonight is puccia night and generally we’ve either been eating very early or back at our hotel). In an hour or so, we’re heading to one of Lecce’s culinary landmarks for lunch, Le Zie. I can’t wait! Because we were recording all day, I was offline yesterday when the news broke: my friend Fabrizio Bindocci, winemaker at the historic Montalcino estate Il Poggione, has been named the new president of the Brunello bottlers association. 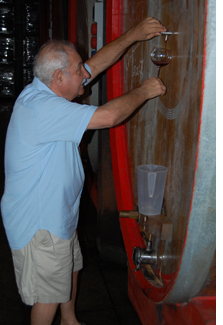 The news came in the wake of Ezio Rivella’s sudden departure from the post on June 8 (for personal reasons, he reported in a press release issued by Montalcino mouthpiece WineNews.it). It’s hard to believe that nearly ten years have passed since the disastrous 2003 vintage and more than four years since the Brunello controversy exploded in 2008. In my view, Rivella’s presidency only prolonged the issue (remember when Rivella told an Italian journalist that 80 percent of Brunello was made with grapes other than Sangiovese?). Fabrizio is a Tuscan (Rivella is from Piedmont and didn’t even keep a residence in Montalcino while president, opting instead to commute from Rome); he was born and raised in Montalcino; he has worked for Il Poggione since 1976; and he is one of the most respected and beloved winemakers in Tuscany today. His presidency marks a new (and happy) chapter in the saga of Montalcino and I — along with many other lovers of Brunello — could not be more thrilled. Tracie P and I will visit with Fabrizio later this year when we travel to Montalcino. It is with a heavy heart that I share today’s news from Montalcino. 1) Rosso di Montalcino Sangiovese Superiore: 100% Sangiovese (with a 1% “tolerance” of other grape varieties). 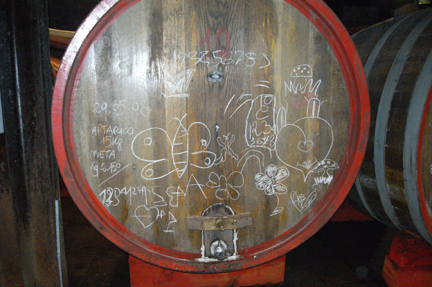 2) Rosso di Montalcino Sangiovese: 100% Sangiovese (1% tolerance). 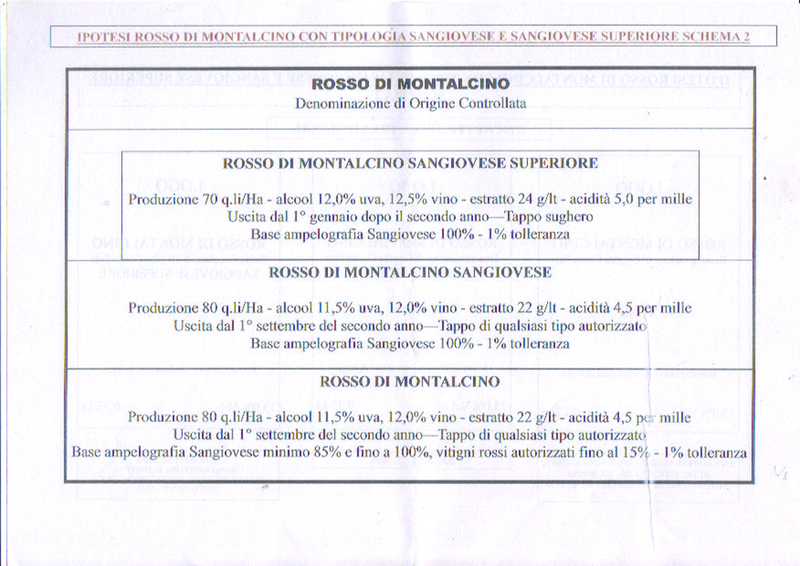 3) Rosso di Montalcino: minimum 85% and up to 100% Sangiovese, “authorized” red grape varieties up to 15% (1% tolerance). Click here to view a full-sized version of the document. 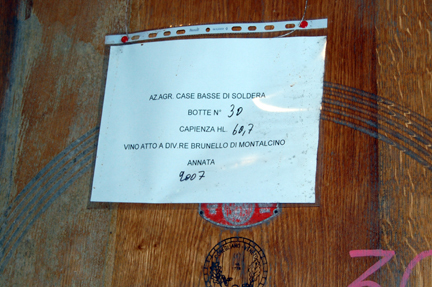 Although it doesn’t appear that the Brunello oligarchy plans to call a vote on the proposal anytime soon, it has called for “ordinary assembly” of producers to put the modifications to the floor (September 7). 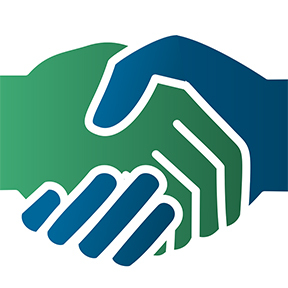 Anecdotally, Franco reports today on his blog that producers are “optimistic” that only 10% of them would vote to adopt the changes. At least one producer wondered rhetorically and philosophically, “why isn’t there a proposal to not change the appellation?” It seems that the powers-that-be are hell bent on opening the floodgates of Merlot in Montalcino. Last week, Montalcino experienced some heat spikes, as warm weather arrived from Africa. I regret that this doesn’t bode well for the 2011 vintage (although at least one producer is reporting cool evening and morning temperatures). I’m with Franco when he says he hopes that the heatwave will pass quickly and stop “cooking the brains,” as they say in Italian, of the Montalcino establishment.